It’s been several months since I tried to put one of my little triangle diagrams together. 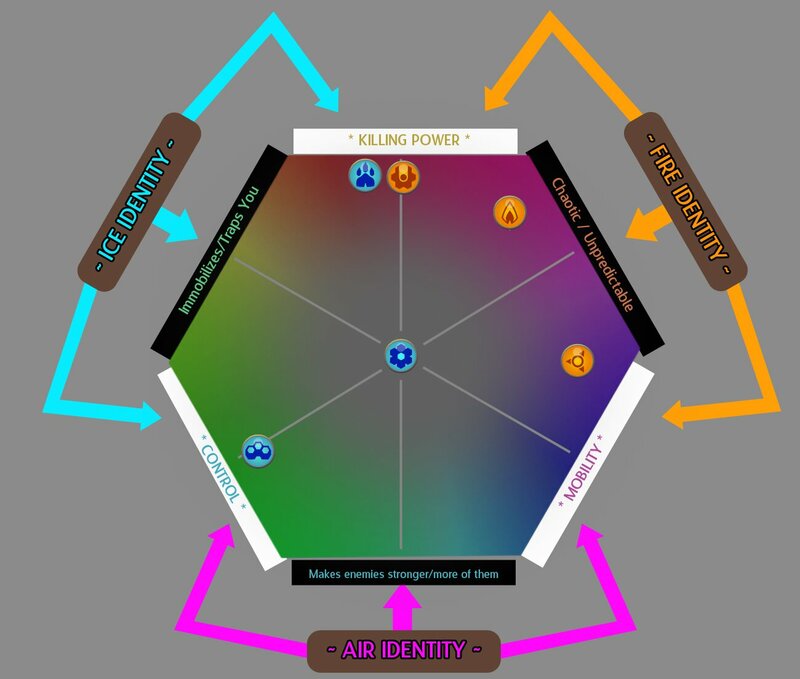 If you’re a regular reader of this blog, you probably remember that I’ve posted about my philosophy for designing abilities for AURO before. I haven’t been doing this for some time, because as I’ve also mentioned, we’re in “let’s get this game finished” mode (in fact, we just launched our Closed Beta a few days ago), and I don’t want to rock the boat if I can help it. I’ve been having another crisis of conscience regarding some of the abilities, though, so it seems like a good time to do another. I’ve taken to calling Auro’s magical tactical spells “abilities” recently, instead of “disciplines” which I had been using for awhile. Probably, I’ll just end up using the word “spells” because it’s the most clear option. Anyway, we’ve been getting a lot of really good feedback from our testers, and the recently launched beta only helped the matter. From everyone’s response, as well as my own copious testing, here’s the current consensus: the game is fun enough as it is, but there are a few key problems. Namely, some of the abilities are just… kind of crappy. All of the abilities have some great kernel of an idea to them, and it takes a lot of playtesting and tweaking to find out of that idea actually works or not. I think that we reached that point with a number of the abilities possibly as long as a month or two ago, but I think I was also hoping that implementing more functionality would make them come together. Well, we implemented, and it didn’t help! There’s quite a few more. In short, though, I just really had to start from the ground up and get down some abilities. So I started making one of my triangle charts. In making this chart, I realized one of my problems: my chart had been the wrong shape all along. Actually, over the years (yes, AURO has been in the works for *years* now), I’ve tried a number of shapes. Most recently, I was trying a triangle. Makes sense, right? There’s three trees, and they’d each fit into one corner of the triangle. Tonight, I realized that that was the wrong way to think of it. Each “pro” quality, such as being good at killing, needs to have a con side as well. So the opposite of “killing” would be something like “creating more monsters” or possibly “buffing monsters”. I’m reminded of Robin Walker, of Valve Software, talking about how when designing the TF2 classes, the weaknesses were even more important than the strengths. 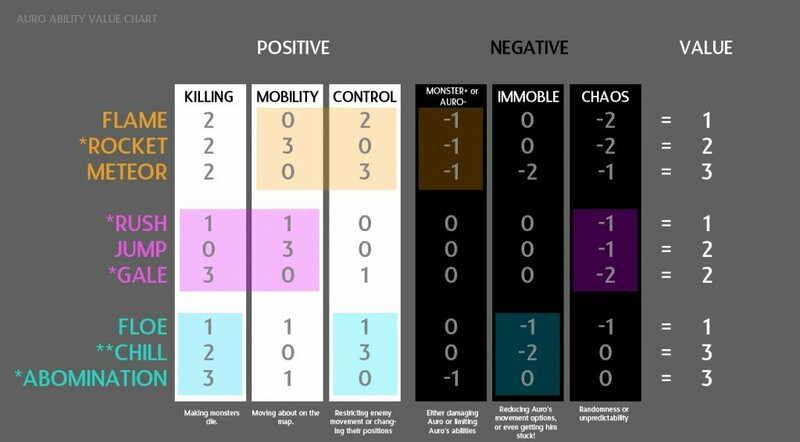 Killing: Does this ability help you kill monsters? Example: Meteor! Mobility: Does this ability help you move around the map quickly or give you more movement options? Example: Jump! Control: Does this ability allow you to restrict enemy movement or move monsters? Example: Floe! From that, we also get the three negative qualities. Hurting Auro: Does this ability have the potential to hurt Auro? Example: Flame! Immobilizing Auro: Does this ability reduce Auro’s movement options and possibly even trap him in? Example: Chill! Chaos: Does this ability cause some random or hard-to-predict effects to occur? Example: Flame! So with that in mind, there should be 6 sides, not 3 (a hex!). I also realized that it would make much more sense to have each tree take on two of the good qualities, and those two good qualities straddle one bad quality. This seems like a really good way to balance the trees out and to be able to hold onto a bad quality while designing. Don't worry, I didn't cut out the Air tree, just didn't finish doing this before I realized another problem. Click to full-size. While making this chart, I realized some other problems with this entire layout style. Where do I put Floe? Floe is kind of a balanced ability, that has killing power, mobility, AND control – at least a little of all three. This kind of a layout doesn’t allow me to express that. So, I tried something entirely different. (Note: I also swapped around who gets what traits). The colored areas are the areas that this tree should focus on. Now, you can see that Fire is sort of all over the place. It has high numbers in all categories, bu the downside is that it has a ton of… well, downsides. Fire is spreading all over the place and burning poor Auro around every turn! Notice that the totals on the far right aren’t all exactly equal. Firstly, as long as they’re close this is OK because the values themselves are totally rough abstractions anyway and probably aren’t 100% correct. Secondly, we always have knobs to tweak, such as cooldowns and durations and such. This restriction really helped me in my design work a lot, and I think that more designers should do this kind of stuff to help them organize their thoughts. Breaking a game’s actions into useful categories is really the only way to make sure that they retain their identity. 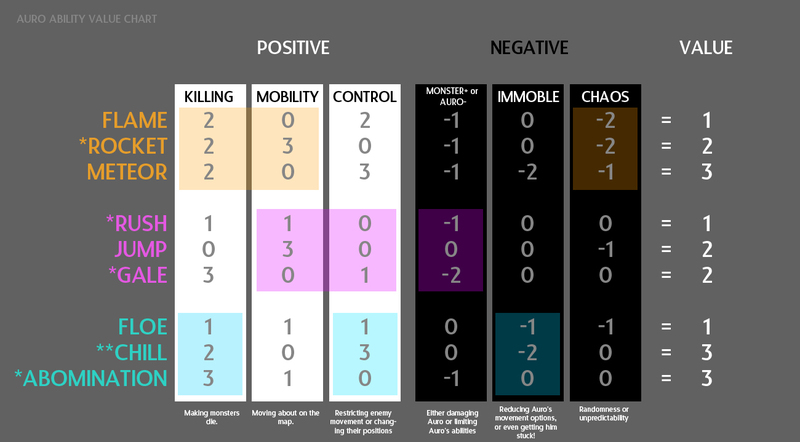 This also helped me come up with some really cool new abilities. For one, since I know now that the Air tree should have a lot of chaos associated with it, I can now ask the question “how”? My answer is to change how currents work. Currents now move about randomly, they don’t paralyze monsters (they can still move, act, or do whatever if they’re on a Current, including walk off the current), they move a monster with them if they move and one is on top of them (that’s the big one), for starters. Also, you can Jump onto them even if they’re over water (although you have to jump right back off, as if you were jumping on a Pillar). Gale now produces a bunch of Currents randomly when used. Rush creates a current in front of you, instead of behind you. Finally – and this is an experimental rule I’m not certain about – but if Auro walks onto a current, the current dissipates and gives AURO a bonus to his AIR ability cooldowns. I also came up with an Ice ability that I think is just freaking fantastic. The new T2 is still called Chill (for now), but what it does is turn all Floes into Ice Blocks, and Ice Blocks into Floes. It also has a very short cooldown. In my testing, this ability is awesome. More stuff to come. We’re probably not going to make our 2012 deadline, it’s looking like, but hopefully late Jan. Important thing is that AURO is the best when it does come out! Thanks for reading! When making lists of things (units, classes, spells, abilities) for quick prototypes, I usually start with a rough utility-calculating formula, and then let Excel highlight everything with value to low or to big. It’s kind of silly that I don’t use Excel. For me Excel is easily the most useful tool when designing boardgames. It is not only good at keeping all data together and extracting all kinds of info from it (average cost of things, probabilities of certain card draws, usual monster encounters and so on), but also helps to prototype quickly. For starters you can throw together game board, random card hands and resource tracks right in the spreadsheet and test things out. And if you want to print out the prototype, you can make standardized components like cards or tokens and automatically populate them with data from your tables. >And if you want to print out the prototype, you can make standardized components like cards or tokens and automatically populate them with data from your tables. Really? I usually make prototypes in Photoshop. How do you do this magic you describe? Photoshop takes a lot of time, it’s hard to make changes in individual elements, and it’s almost impossible to change something like layout in all elements at once. 1. Make a regular table, one row for each element (spell, unit, whatever). Fill in all the properties you want to show on the component – cost, damage, description. Each row must also have a unique number. 2. On the new sheet, draw new components using cell borders. If you want MtG-sized cards, 3×3=9 will fit on one printed sheet. 3. Put a number on each card, maybe somewhere in the corner. 4. To fetch data from your table, use VLOOKUP function. It should take card’s number, look up a row with that number in original table and return one of the cells from that row. 6. Use Conditional formatting to highlight cells with different contents (water magic may be blue, elite units may be yellow and so on). Of course, end result will look shabby, but it works and it’s superfast. For later stages I recommend using InDesign: it allows to modify layout/text/pictures in multiple elements at any point, the content boxes instead of actual pictures are pretty cool, and there are more tools for working with the text. That’s huge! Thanks so much for the advice. It’s kinda funny, but a student project I’m working on, we have a similar triangle for each character (killing, mobility, control). Also, I was a bit confused when the numerical chart switch around the strengths and weaknesses of fire and gale… for a while I thought that I was reading it wrong, and then that you made a typo. Written statements would have been nice. And another thing, what are the asterisks for in the chart (next to the ability names) and what is this rocket ability? Oh, yes, I did switch those. It wasn’t a typo, and yeah I should have mentioned it. Will make an edit. Asterisks mean that there are changes (two asterisks mean a lot of changes). Rocket — honestly, I’m not totally sure what that is yet, but one of the 100s of discarded abilities might be what we need (it moved you a second time every time you moved, in the same direction, dealing damage to anyone you touched). Sounds like it conflicts with rush a little bit. Actually I realized the reason we can’t do that. It would require clicking on a specific tile, which is against our design philosophy. How about instead of specific tile, you just choose a direction and you blink/explode to the nearest(or farthest) visible flame? I’m not sure about near/far. On one hand, near flames keep you in the action; it’s useful but easily blocked by careless use of flames (and liches!). On the other hand, far flames is much more useful, and almost always allows you to escape tight situations at the cost of health; near flames can be too limiting and create false choice where the opportunity to use it would be far too rare. It’s hard to make suggestions about subtler mechanics without having played the game. One person suggested that a blazing rocket would be in two phases. So, you get to rocket 2 tiles in a direction, and then immediately after you choose a new direction and do it again. Very cool to see the numbers behind your design process! Am I crazy, or are the numbers for Meteor off? I see +2 Killing +3 Control, and -1 Auro -2 Immobile -1 Chaos. 2+3-1-2-1 = 1, but you have 3 listed as its ability total. Meteor stills has a 3 in control. And the primary strengths are switched again. Oh right. It *will* have control power later because it will destroy tiles.